The site was formerly known as the Bridges Juvenile Detention Center, which shut down in early 2011. The joint proposal to redevelop was introduced by Gilbane Development Company, the Hudson Companies, and the Mutual Housing Association of New York (MHANY) in October 2016. According to the NYCEDC, the full plan will yield 840,000 square feet, including 740 affordable housing units, 52,000 square feet of recreational space and a public plaza, 50,000 square feet of light industrial space, 53,500 square feet of artists’ community facility space, and 15,000 square feet of retail and commercial space. Permits were filed for a 190-foot tall structure that will yield 196,340 square feet, with 166,580 square feet dedicated to residential use, 18,580 square feet for commercial use, and 650 square feet dedicated to community facility use. 183 apartments will be created, averaging 910 square feet apiece. WXY Architecture is responsible for the design. Construction is expected to start soon, with phase one finishing by the first quarter of 2021, phase two finishing in 2022, and phase three in 2024. The proposal will cost $300 million. 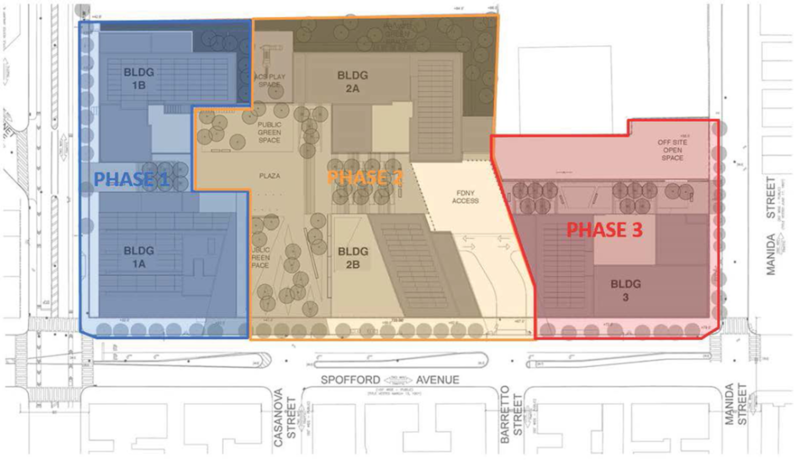 7 Comments on "Permits Filed for Phase One of Spofford Redevelopment Project “The Peninsula,” Hunts Point, The Bronx"
Please pardon me for using your space: I come here and bring your report to an end. Thank you. Abatement & Demolition have started onsite. Sound Barriers are being utilized along Tiffany Street as well. I think it’s shameful that affordable housing has to be in every new project what about the upper-class middle-class about giving us a break!?! NYC has tax incentives for affordable housing, but developers aren’t required to include it. A lot of the developments on YIMBY don’t. So you have your choice. Where are your comas. How about to read your crap. Affordable housing is included in this project, and if you don’t like to live in NY, then go to Florida!!! Maybe you stop whining about “hard life” when you will be waiting for local buses there for 30 min to 1 hour with no seat on the bus stop!!! Or going to California, next to bum living next to your building lobby or front yard, and enjoy brownish tarned grass instead of green and concrete covered dried up rivers!!! Affordable housing only means that there are units set aside for those making a certain percentage of the metropolitan area median income. Unit household income requirements vary widely. omg, now the developers are moving into hunts point?